← I Want To Wake Up In . . .
Elvis knew what he was signing about in Jail House Rock! Fun times to be had! Wait, what??? Near an area known as Seaport Village in Downtown San Diego, a major structure has been standing empty waiting to be put to good for decades. In 1939, a 100,000 square foot Police Headquarters was constructed. Amongst the five buildings, it housed a crime lab, 274 jail beds, courtrooms, a three-story gym and more. Eventually a larger space was needed, so the new police headquarters was relocated at Broadway and 14th in 1987. The original building was going to be demolished, but some wise people fought against that and had it added to the National Register of Historic Places and the California Register of Historical Resources and preserved the architectural styles which consists of Spanish Colonial, Pueblo Decor, Mediterranean, and Classical Revival. Today, when you go to The Headquarters (http://www.theheadquarters.com/) you will be much happier than the previous “visitors”. It’s a retail bonanza! Now you can shop and dine to your heart’s content. There are 23 businesses and there are a few more to open in the near future. What I was looking forward to the most was Pizzeria Mozza, owned by Nancy Silverton, Mario Batali, and Joseph Bastianich. I had the Burrata and Oven Roasted Tomato appetizer at their location in L.A. some time ago. I still dream about those amazing flavors. I’m so happy to have the opportunity to dine there with only a 15 minute drive! 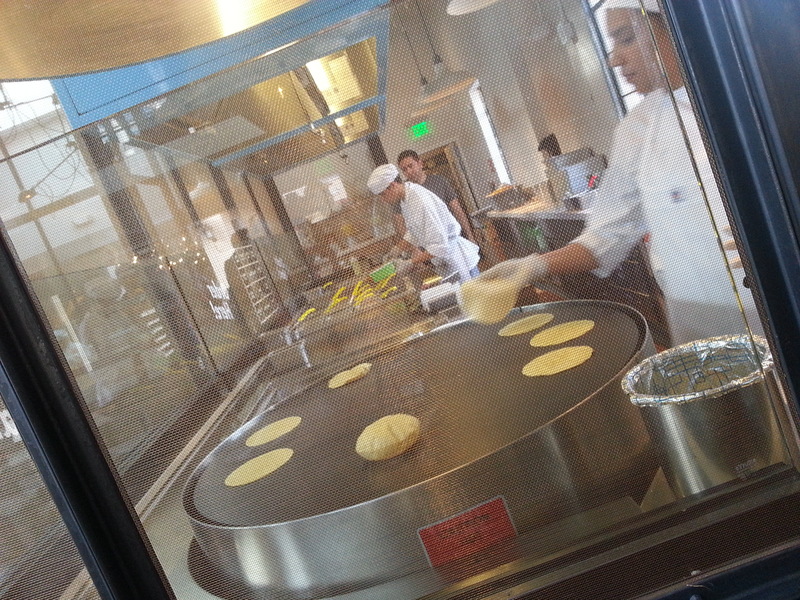 A group of us Food Bloggers were invited to check out the new facility this past Tuesday. The renovations are truly amazing. Original skylights, clay roof tiles, courtyard pavers, carved-wood doors, ceramic tiles, ironwork on the windows, light fixtures, all have been saved. 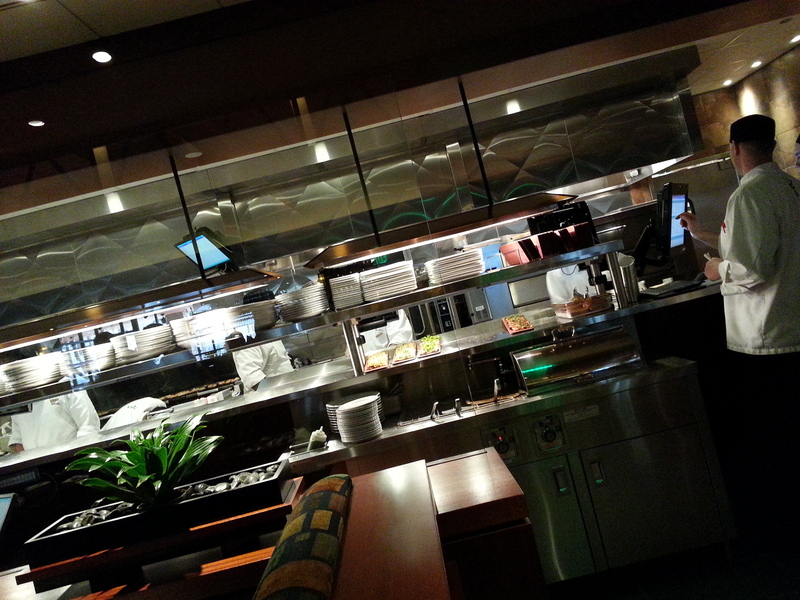 Each restaurant and shop very wisely incorporated what was original to the space. 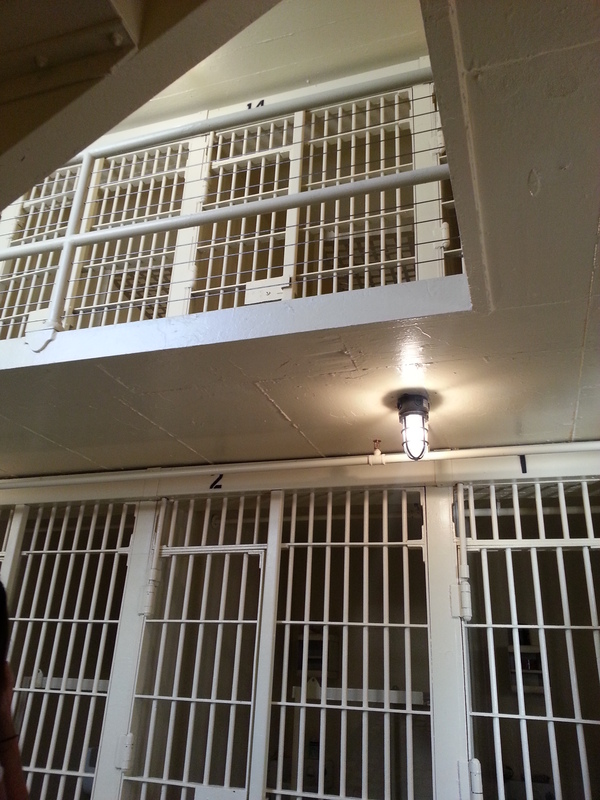 You can take a quick tour of the original jail cells, browse past some Historic Police memorabilia, and look at photos of criminals who spent time behind the bars. And it lists the crime committed by the people, which is very entertaining. Again, for you, not them! My favorite crime listed was “Weed Head”. I will mention just a few of my favorite spots because there is so much to discover here. 1) Aaron Chang Ocean Art Gallery (http://aaronchang.com/gallery): Mr. Chang’s photographs are crisp, inviting, and intriguing. What I love is that he wants you to know the story behind the images. My background is in Art History, so I’m accustomed to trying to decipher meaning behind a painting. I found it very cool that he wants to share the story of his work. Next to many of the images is a QR code that you can scan with your phone to get more information on the photograph. 2) Dallman Fine Chocolate Boutique (http://www.dallmannconfections.com/): We weren’t able to try the chocolate, so I can’t tell you how it is. 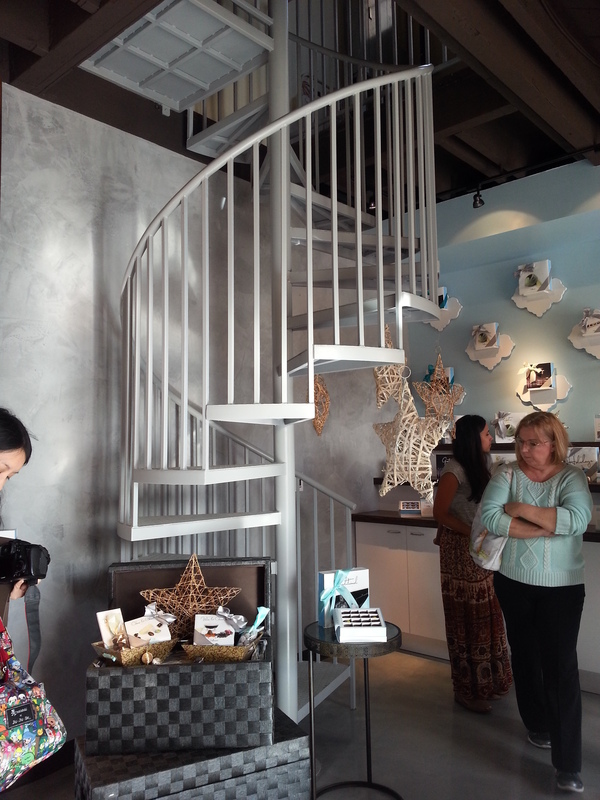 I can share that I love the cute little interior of this shop. This is a family business that started in Austria in 1954. In 2006, they opened a shop in San Diego. What I loved about this store is their pairing suggestions. 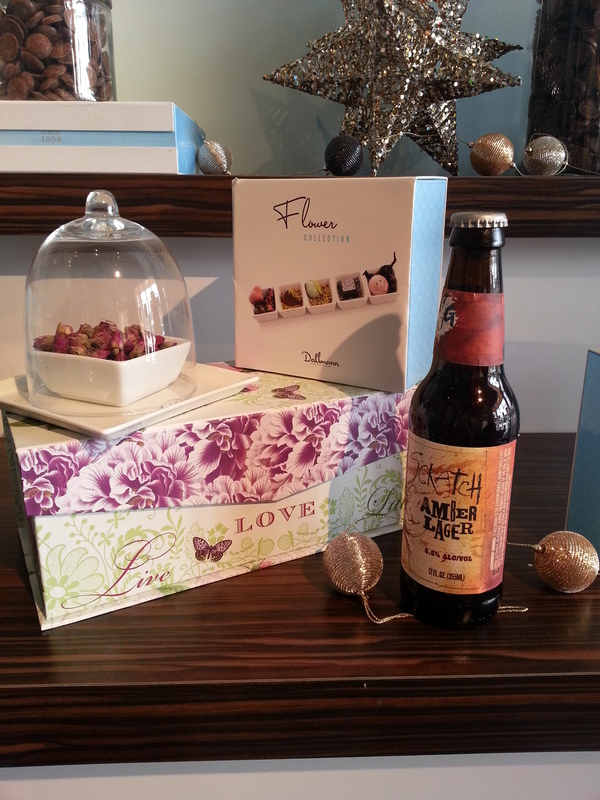 Since I just had a beer, cheese and chocolate pairing at my house, the Chocolate and Beer Pairing Box caught my eye. This is a great option for someone who is afraid to make the first step in pairing two of the best things in the world. I loved that the original spiral staircase is Dallman’s. Prisoners would go through this area for processing. 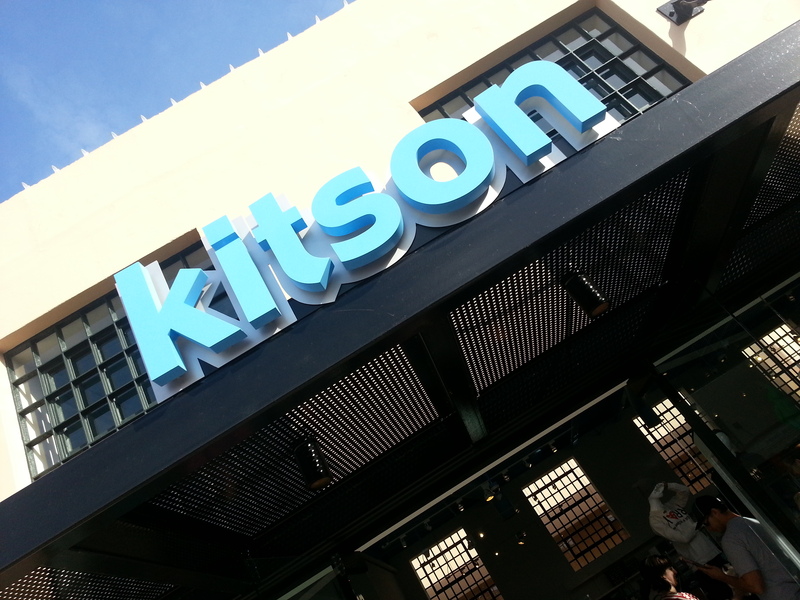 3) Kitson (http://www.shopkitson.com/): If you know someone who loves to be an “L.A. 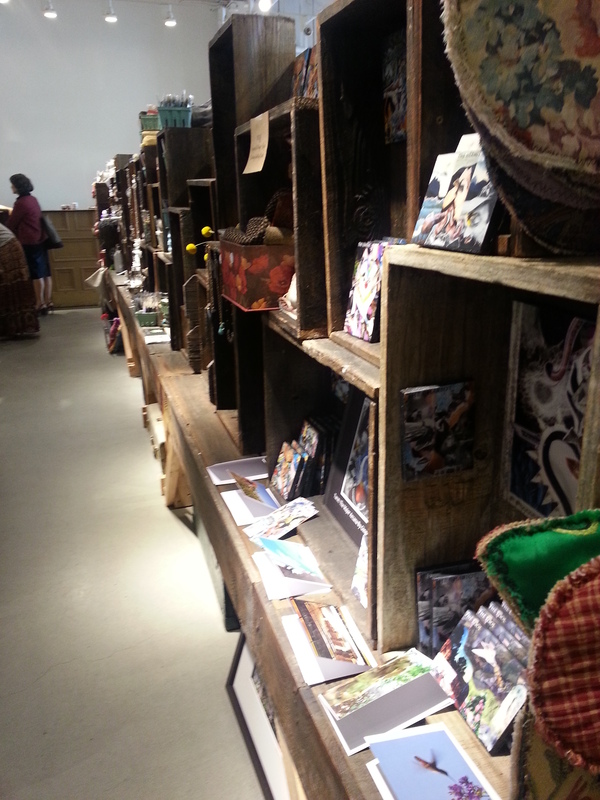 Hipster” (I’m thinking my niece would love this place), you will find some great gift ideas here! 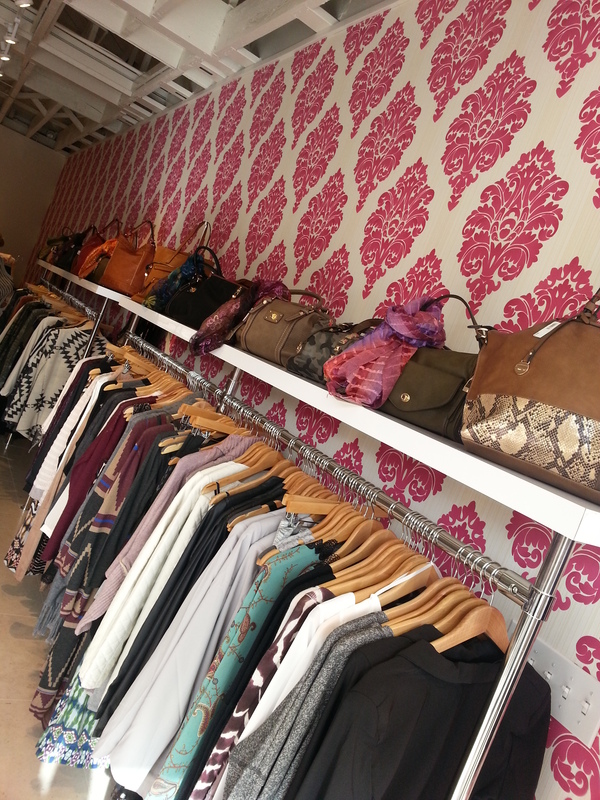 4) Lolo (https://www.facebook.com/LOLOBOUTIQUES): If you are over the age of 25, this is a great locally owned shop for you. Everything is really well priced and super cute. This was one shop I had to return to after our tour was over and buy a sweet necklace for $15. We were told that the owner likes to take ideas from the major runways and make it affordable. Stop in this place, and you will leave with something. 5) Pizzeria Mozza (http://www.pizzeriamozza.com/): Originally an L.A. restaurant, it has a full menu, but it is known for its pizza. As I mentioned before, the Burrata appetizer I had in L.A. was phenomenal. 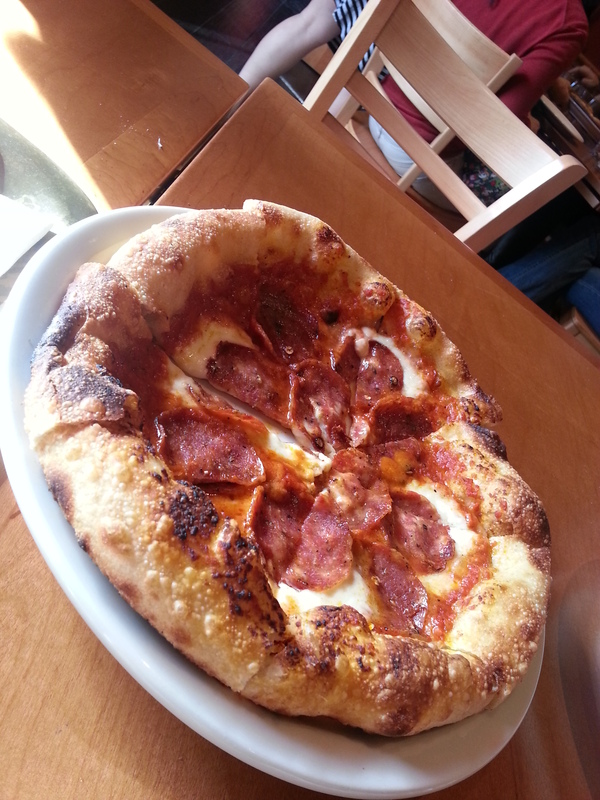 At this location, we sampled two pizzas: a Mushroom, Fontina, and Taleggio Pie and a Finnochiona Salame, Mozzarella, Tomato and Fresno Chiles Pie. My favorite was the meat pizza. The tomato sauce was so bright and fresh with a nice flavor of olive oil and an extra kick of heat from the chiles. I’d recommend this one! 6) Puesto (http://www.eatpuesto.com/): I love this place. Quickest review ever: Super friendly staff, amazing Mexican street food, restaurant designed by the well-known Thomas Schoos, mural artwork by Chor Boogie (http://www.chorboogie.com/), and a trifecta when it comes to mixologists – you will not get some crappy Margarita here, my friend. And that term “mixologist” can be used loosely or just plain incorrectly. Not here. Check out this bio: http://queenconnerward.com/about.html Jen Queen told us about some interesting tequila events that are upcoming, and explained that they do table side Margarita mixings. Who doesn’t love a drink cart that pulls up tableside? Do not miss this place. 7) Seaside Home |Paper: The store combines the best of their La Jolla location (http://www.seaside-home.com/) and their Coronado location (http://seasidepapery.com/) in one spot. Is a friend about to get married? 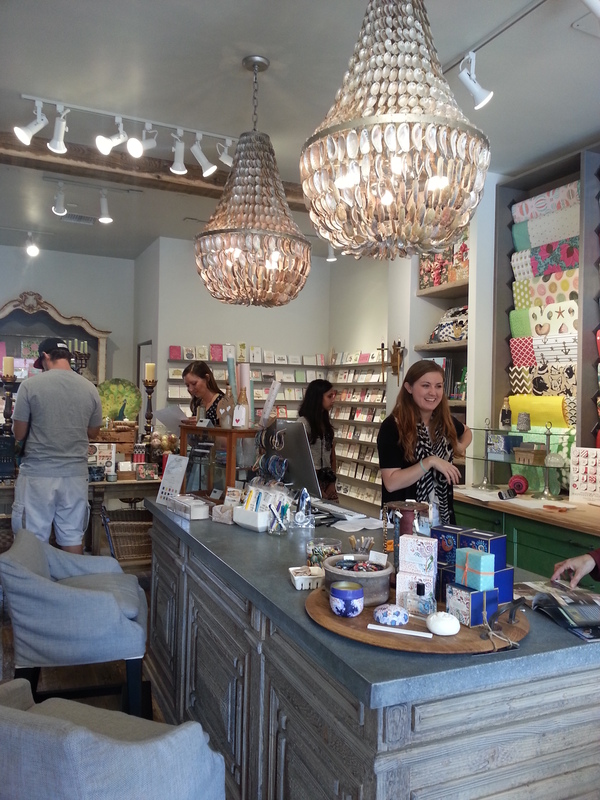 Stop in here for wonderful stationary, wrapping paper, or custom monogrammed paper coasters. There are so many fun things to see here. Don’t pass it by. Seaside Home|Paper is beautiful inside! 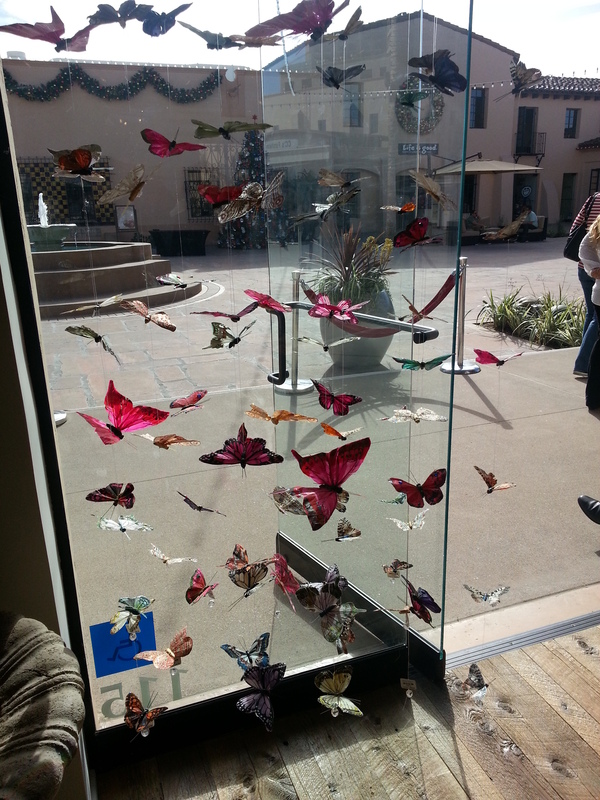 Seaside’s window display was so pretty! 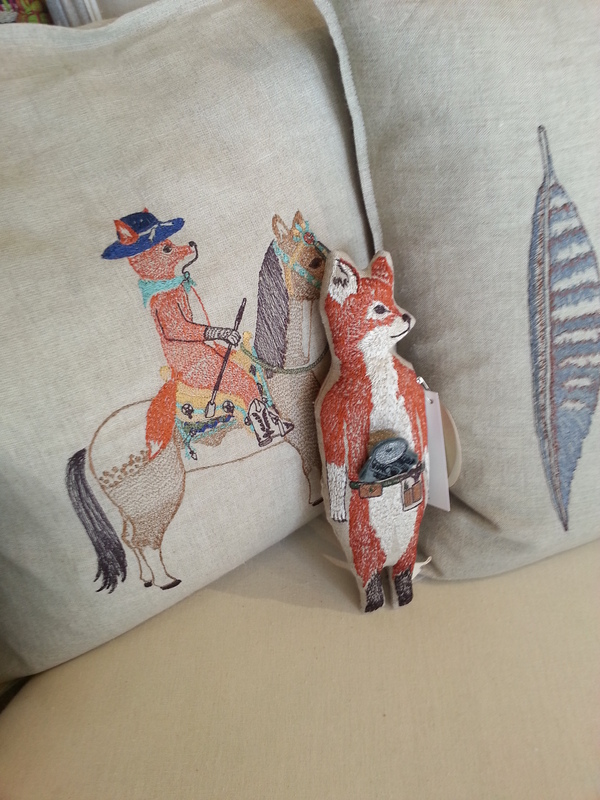 Maybe you can find out what the fox says at Seaside? 8) Seasons 52 (http://www.seasons52.com/): Talk about friendly! I loved this place. We tasted some lovely flat breads that weren’t too heavy while sipping on a delightful Raspberry and Mint Lemonade. We capped off our tasting with beautiful and very tasty individual desserts. 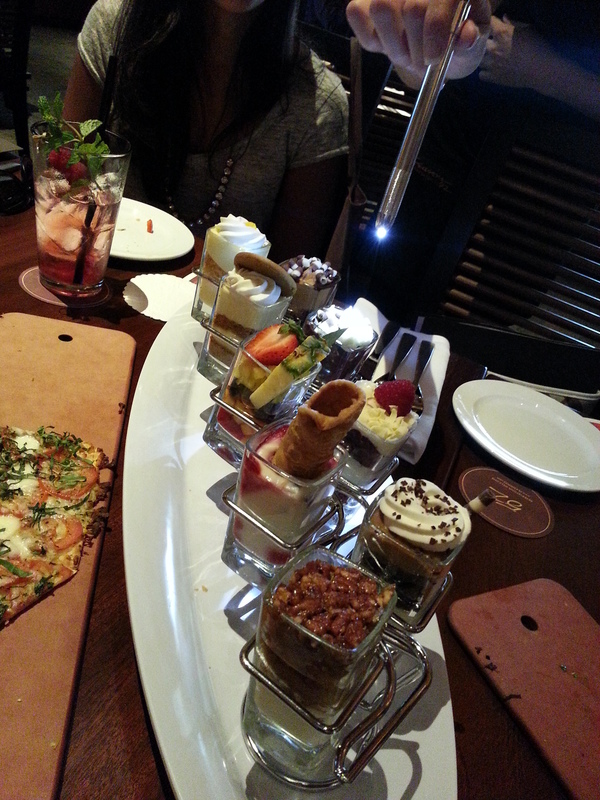 The Pecan Pie was to die for! “52” refers to the 52 weeks in a year, hence many menu items are constantly changing to incorporate Seasonal items. Having a special party? Go here and request the patio or their Chef’s Table. The little tastes we got just makes me want to go back and investigate this place further! FYI, if you don’t live in San Diego, they have a bunch of locations throughout the U.S. The Pecan Pie at Seasons 52 was amazing! it tasted like Pecan Pie Crème Brulee! 9) Simply Local (http://simplylocalsandiego.com/): LOVE, LOVE, LOVE this place. Looking for an extremely cool gift to give to someone that is made in San Diego? Look no further. Have a friend who loves local honey? It’s here. Love Pub Cakes? Buy their mix here. Don’t even know what Pub Cakes is (http://pubcakes.com/#craft-beer-cupcakes)? See what your San Diego small business owners have been up to in one spot! Need a hip beer t-shirt? Simply Local has you covered. Not only are the products for sale so interesting, the shelving has a unique story as well. Owner Brian D. Beevers made them out of his family barn. Yep, it’s that kind of store. I hate shopping, but I can actually spend a day in here. Simply Local is simply awesome. 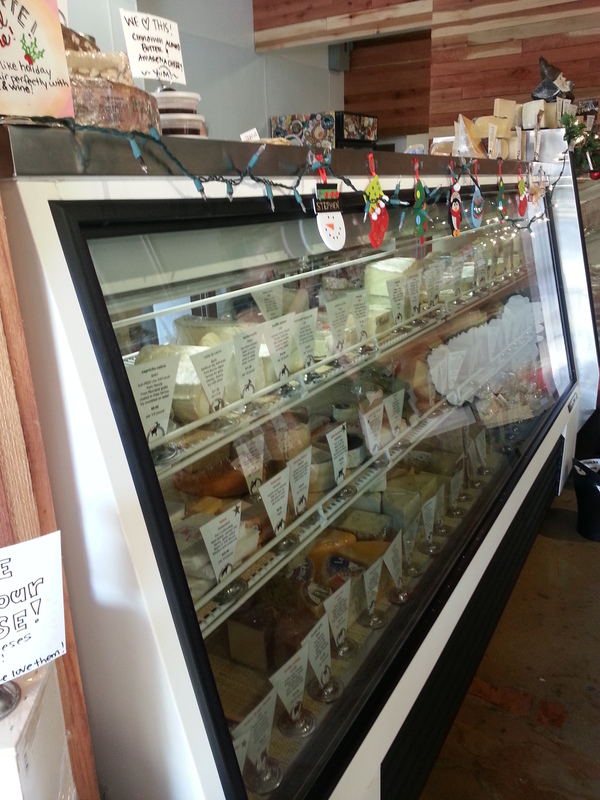 10) Venissimo Cheese (http://www.venissimo.com/): Best cheese store in San Diego. Boom! Need I say more? Apparently Venissimo means Cheese Heaven in Italian. Possibly the best single bite of the day. Thank you, Venissimo. 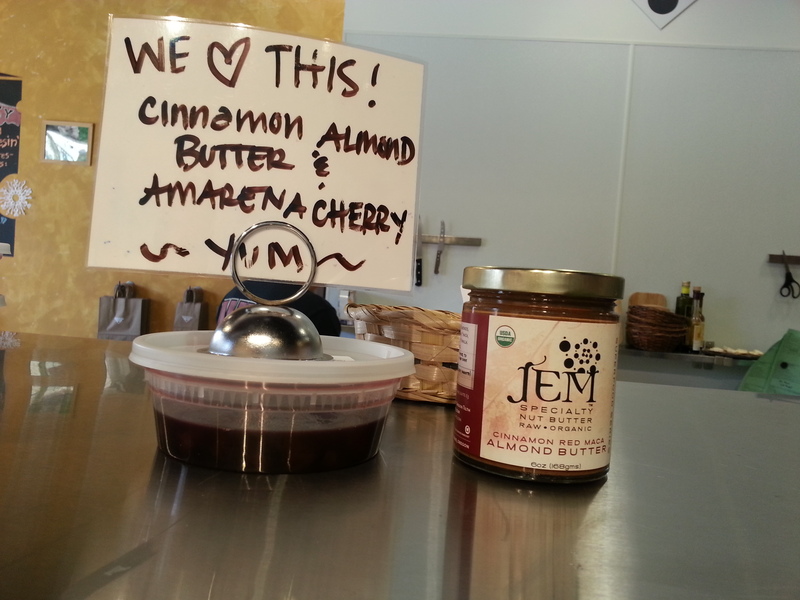 This Cinnamon Almond Butter paired with Delice de Bourgogne and topped with an Amarena Cherry. Want to amaze people at a dinner party? Start with this treat. 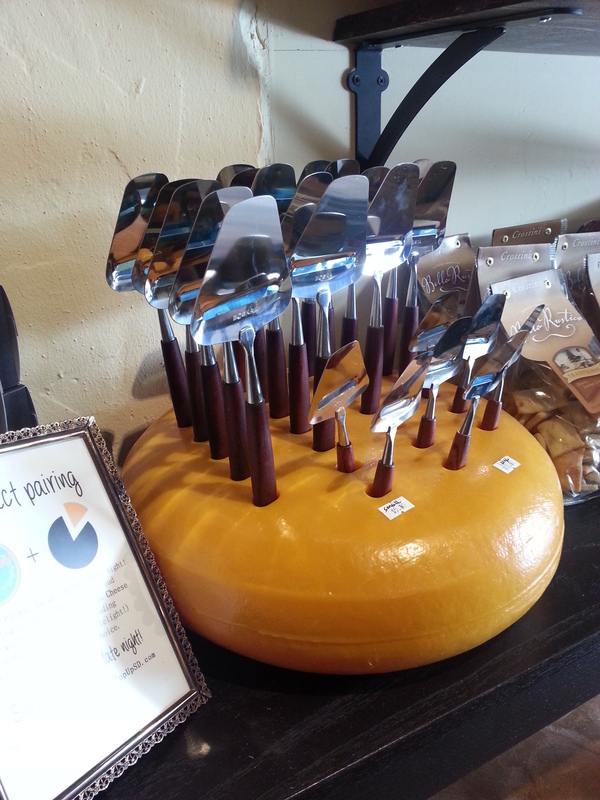 Cute gifts to be had at Venissimo, too! And crackers! And meat! And, ok, I’ll stop. $15 from 3pm-11pm all day Friday through Sunday. There is self parking at the nearby Seaport Village. With a minimum $10 purchase, you pay $3 for the first 2 hours and $2 every 30 minutes after. Without validation, it’s $8 an hour. I’m always bummed when I have to pay to park at a place where I am coming to spend money. Oh well. Such is life. I promise to have a couple of tasty recipes coming up soon! Thanks for taking the time to read my blog! Take Care, Happy Eating and Happy Holidays! 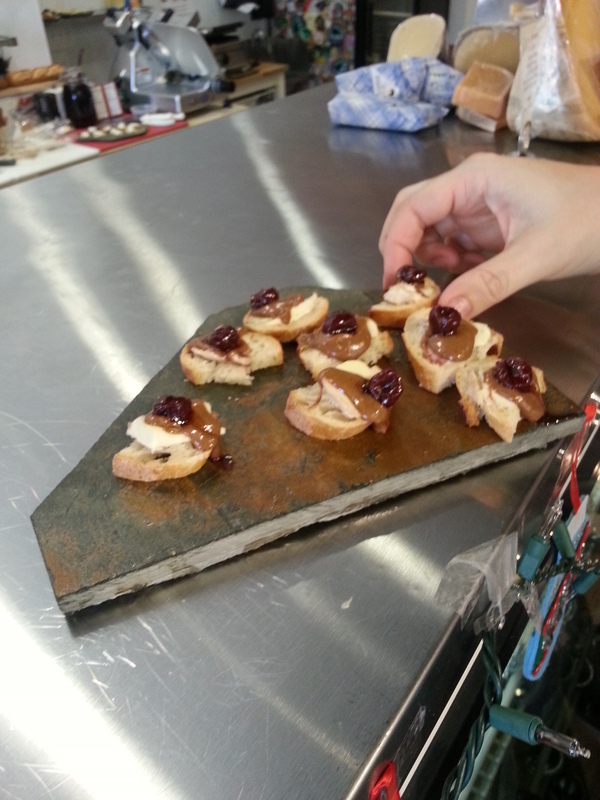 Mouth watering….cannot wait to visit again, what a great find! Does Puesta compare to that taco/burrito street shop that we brought Sarah and Elena to during our last visit (the name escapes me right now)? Sarah was just raving about that shop, her burrito (and the little window with the man sitting there waiting to take the order…she said that was hilarious). 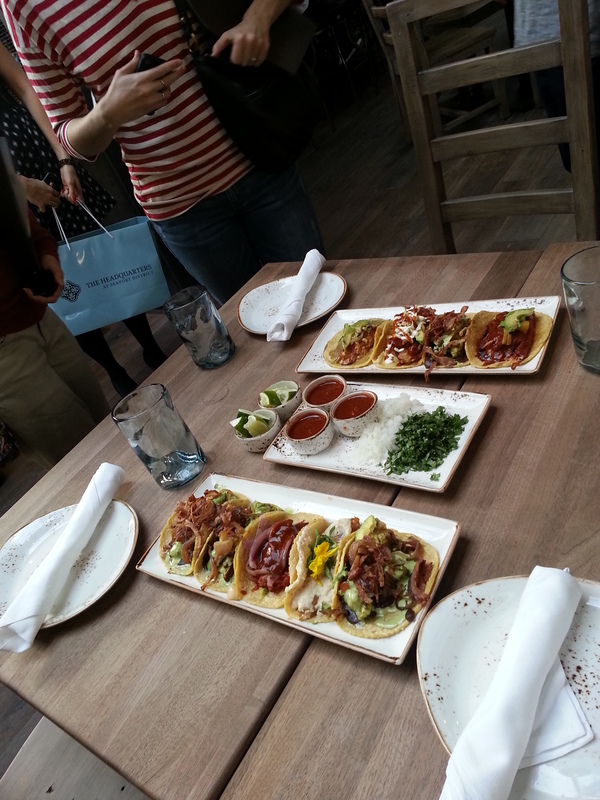 Wishing we were there, right now, to indulge in the goodness that San Diego always brings to the table! I hope you enjoy it as much as I did! And it’s a beautiful sunny day today for a visit! Thanks for reading! Love, love, love the song. Nice that you put that there. This is exactly why people shouldn’t get rid of anything in the community that has significance. Will definitely keep this in mind when I return back to states. 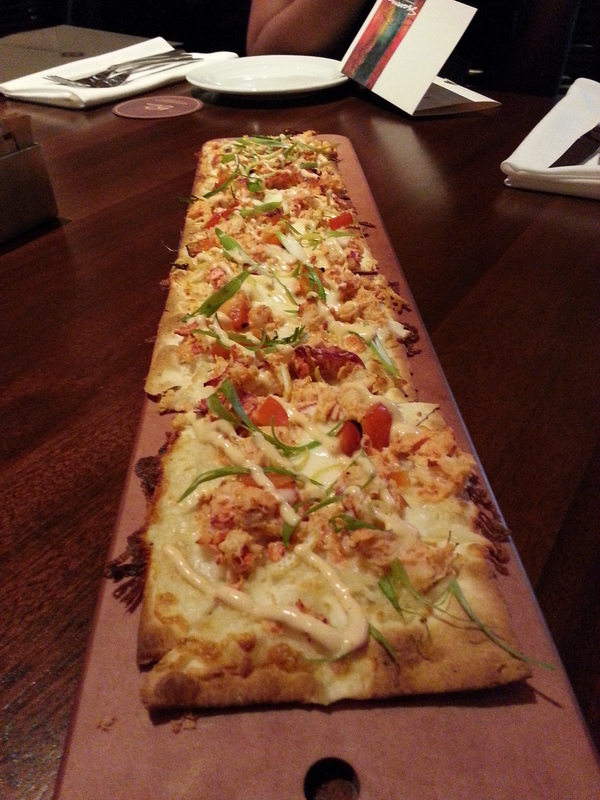 I’m curious about the lobster flatbread. Looks YUM! Thanks for the share.